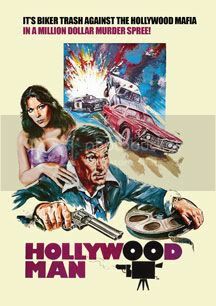 Hollywood Man (or Hollywoo-ood Maa-aaan as the guy who sings the title theme warbles it) is a fun 70s action movie that is low on budget but high on stunts and other exploitation elements. This movie was directed by Jack Starrett, who was responsible for a few Blaxploitation flicks (Slaughter, Cleopatra Jones) and a few Southern goodies (A Small Town in Texas, Race with the Devil). The real reason I wanted to see this is because I am a fan of the two leads, William "Falconetti" Smith (as the original poster bills him) and Corman favorite Mary Woronov. In Hollywood Man, Smith plays Rafe Stoker, an action star who gets funding from the mob to finish his current biker film. The stipulation is that the film must be completed in four weeks or Stoker will owe them a poopload of money. The mob then hires some goons to try to stop production so they can collect. There's just something special about low budget, exploitation/action films from the 70s. Especially ones with William Smith and Mary Woronov. Having Don Stroud pop up doesn't hurt either (he seems to be in a lot of this sort of movie). Hollywood Man is a perfect example of this type of film and though its not the best of it's sort or even close, it has enough to hold my interest. There are some great car chases and motorcycle stunts, which counteracts the bad dialogue and bad acting. You pretty much already know if you're going to like this film or not before you watch it. One thing I will say, is that the ending of this movie is brilliant and makes the whole experience seem much sweeter than it probably was. You can buy a copy of this film directly from MVD HERE . The quality isn't perfect but it's fairly cheap.